The source of all TMD symptoms is the retrusion of the mandible. The solution for TMD must be the repositioning of the mandible anteriorly. TMD might be considered a medical issue but it can only be solved dentally. It takes a dentist with specific skill sets to reset the bite. Dentists, however, are simply not trained to change the bite. Dental schools only train their dental students to keep the bite the same. When a filling is done the dentist will try to keep the bite the same. When a crown is done the dentist also tries to keep the bite the same. When a crown is not fitting correctly, the patient might start complaining about jaw pain because the dentist had inadvertently changed the bite. The dentist must then adjust the crown or replace it entirely in order to bring back the old bite position. Changing the bite is perhaps the most complicated thing a dentist can do. At this point dental schools have no program to treat TMD. They all have, however, a "Pain Management Center" when it comes to TMD. “Pain Management” simply means “I don't know what it is that ails you, therefore I am just going to give you pain medications.” Orthodontists change bites regularly when they move teeth around to straighten them out. They are generally aware that every time the mandible is forced backward it might elicit TMJ symptoms. But by using "4-bi" extraction technique they end up having a smaller maxilla and the subsequent retraction of the mandible in order for the teeth to be in contact. Extraction orthodontic technique, if not done carefully, can cause TMD. In many cases a combination of techniques must be utilized to move the mandible forward. 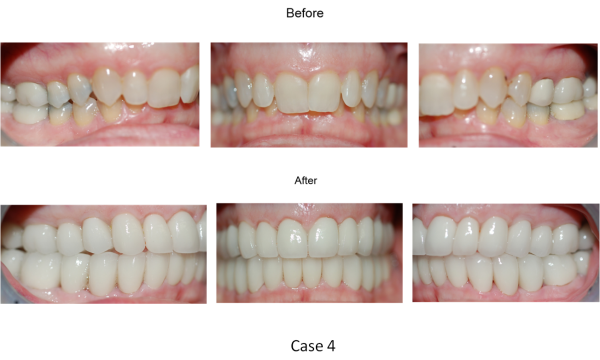 The clinician must be experienced in many aspects of dentistry to achieve this feat. The following cases show how some TMD patients were treated. There is no fixed formula as to how to move the mandible forward. In each case all factors that causes the mandible to get “trapped” in the back must be carefully considered and the subsequent methods to “free” it from that bad position to be able to move it forward. Patient: 42 year-old female with headaches three times a week, experiences pain behind both eyes, snores at night, has no ear problems, and experiences head and neck muscles stiffness. Diagnosis: Class I Skeletal and Dental, narrow maxilla, head postures forward to open airway, headache is from retruded mandible. Treatment: TMJ Splint at night, NSAID for 1 weeks. Rationale: Wearing the TMJ splint 8 hours every night will allow the mandible to freely move forward to relieve airway obstruction. All symptoms improve significantly after 2 weeks. Patient: 69 year-old female with constant headaches, neck aches, pain and stuffiness in both ears, snoring and teeth grinding at night. She has gone to all the doctors and dentists but no one could tell her what is wrong. She has been suffering with TMD symptoms all her life. Diagnosis: Moderate TMD due to Class II Dental, narrow maxilla, lingually-tilted central incisors, and edge-to-edge posteriors due to narrow maxilla. 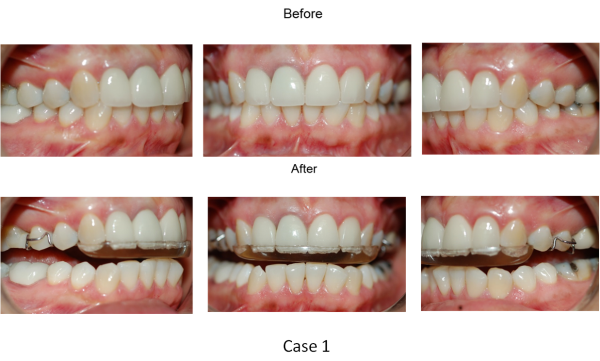 Treatment: limited orthodontics for 6 months (upper arch only). Rationale: The main obstruction to the advancement of the mandible is the lingually-tilted central incisors. The incisors can be straightened out using traditional orthodontic techniques. Even when she is not biting, her mandible is free to move forward after the upper incisors were straightened out. All her headache disappeared in two months. Patient: 46 year-old female with frequent headaches, neck aches, pain and stuffiness in both ears, jaw clenching day and night, snoring, jaw pain on both sides with clicking sound, and limited mouth opening. She had a sinus surgery a few years prior that she and her ENT doctor thought was responsible for her constant headache. Diagnosis: Moderate TMD due to Class II Skeletal, excessive overjet, deep overbite, and large tongue. 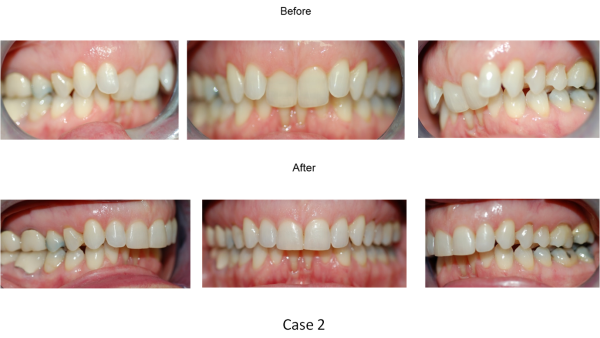 Treatment: 1 ½ years of traditional orthodontics followed by crowning of all lower posterior teeth (8 total). 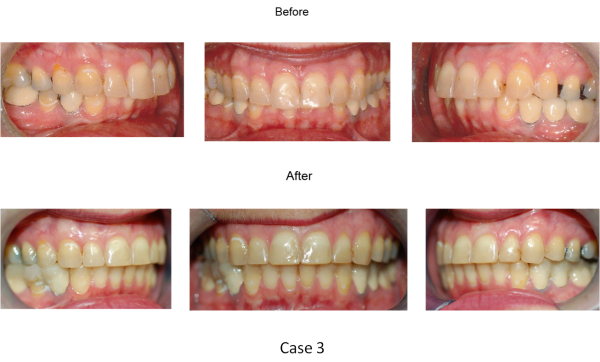 No symptoms after de-banding and de-bracketing. Rationale: The mandible can be repositioned forward using orthodontic techniques. But since the lower posterior teeth cannot be super-erupted to meet up with upper posterior teeth they must be made higher with crown and bridge techniques. Patient: 50 year-old female with 20+ years of suffering with all TMD symptoms: jaw pain on both sides, limited mouth opening with clicking sounds, frequent neck aches, stiff neck muscles, snoring at night, jaw feeling tired after meals, teeth grinding at night. She is also taking anti-depression medication because her doctors were unable to diagnose her symptoms and believed that the pain was "in her head". She takes ibuprofen daily for pain relief. Diagnosis: Class II Dental, narrow V-shape maxilla, deep overbite 100%, severely lingually-tilted incisors 8 & 9. Treatment: Full-mouth reconstruction. Teeth 8 and 9 need root-canal therapy for angulation change. Rationale: In order for the mandible to move forward the maxilla has to be widen transversely and sagittally. The width of the maxilla can be made wider transversely by fabricating the posterior crowns accordingly. The anterior teeth 7, 8, 9, and 10 must be angulated buccally to increase the length of the maxilla sagittally, hence the necessity of RCTs on 8 and 9. Enlargement of the maxilla must be done prior to work on the mandible.